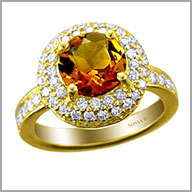 18kt yellow gold diamonds and citrine ring,1.1220ct of diamonds. Truly unique. This ring is made in your choice of polished 18K gold and features one round cut 8mm citrine in a four-prong setting at the center. Outlining the center stone and along the shoulder are 102 fully cut round diamonds in four-prong settings. The total citrine weight is 1.60ct and the total diamond weight is 1.1220ct (both approximate). Diamond color is G- H and clarity is SI.